The Little Man had a fall off his loopfiets over the weekend, and we had a bit of a learning experience finding out what to do about minor injuries when the doctor's office is closed. Yesterday, we had an unexpected extension of our adventure. On Monday night, being a curious 3-year-old, Little Man pulled off the steri-strips helping the "human glue" hold his chin in place. As soon as the steri-strips came off, we were back where we started. 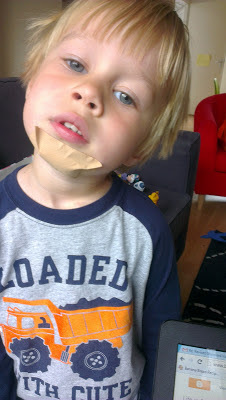 We bandaged him up to keep his chin clean and waited until the morning to call the doctor. As it turns out, the office for our huisarts (primary care doctor) is closed this week for training. It's not uncommon for a doctor's office to close for a week - the doctor's office arranges with another nearby office to take patients as needed. You're encouraged to call first thing in the morning to make an appointment to see the doctor (typically between 8am and 10am - at least with our huisarts experiences) Perhaps because of the increased load (between another office's patients and the people coming in after a long weekend), the phone number was busy for longer than I've normally experienced, so we sent Little Man to peuterspeelzaal since we didn't know when we would be able to see the doctor. After a while, I did make it through and got an appointment for later in the morning. The visit was uneventful. Little Man's cut got another cleaning and more steri-strips, and we were told it will probably take a little longer to heal and have a slightly bigger scar since the healing process was interrupted. Before we were sent on our way, the doctor told the Little Man he MUST leave the bandages alone. Hopefully that warning sticks, along with the steri-strips. An even bigger band-aid for added armor.